IMAGE: Sandymount Green West is the most problematic of the three sides of the green. COMMENT & ANALYSIS: Dublin City Council’s south east area committee is meeting on Monday and one of the issues they are considering is the Report on Sandymount Green Traffic — this is an interesting as a case study of in how the city council transport section looks at traffic and speeding. IMAGE: The devil is in the detail in the report — you have to zoom in to read the top speeds and it’s likely unreadable printed out on A4 paper. We’ve extracted the speed data tables and re-published them below. That was Portobello, but fast forward to 2018 and we have council officials stating that “Sandymount Green is a 30km/h Area; ramps are only implemented on 50km/h road(s)” when a speed survey shows most drivers traveling at around 40-50km/h, and many exceeding this, with the top speed recorded of 69km/h. So, in 2013, councillors were being told measures were not needed because the 50km/h limit was not being exceeded (ie there was “no speeding”) and, now in 2018, councillors are being told speed ramps are not needed because the limit is less than 50km/h. 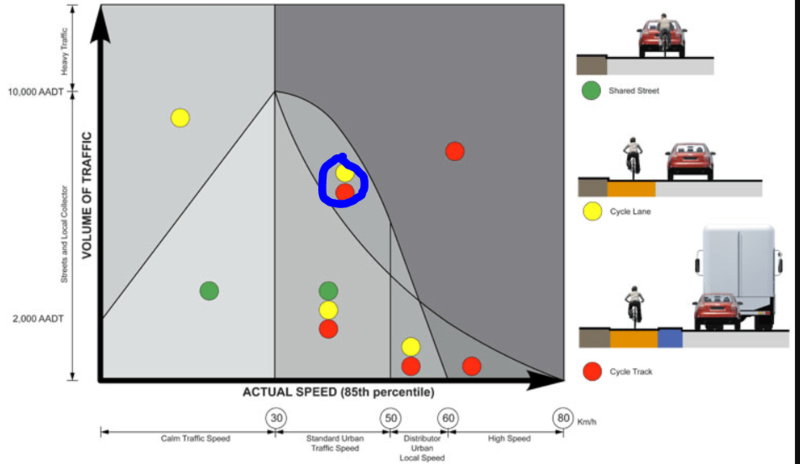 What engineers call the “85% percentile” measurement of speed is often overly complicated, but basically it’s the speed that only 15 percent of vehicles go faster than, and 85 percent go at or below this speed. Road safety advocates around the world see issues with the 85% percentile — one issue being it hides very high speeds by the 15% of motorists are hidden. The speed surveys for Sandymount Green area show 85% of vehicles as 48km/h on Newgrove Avenue which approches the green, 42km/h on Sandymount Green West, 37km/h on Sandymount Green South, and only Sandymount Green North where the speed limit was just 1km/h over the 30km/h limit. The top speed recorded are even higher. On Sandymount Green North it was 50km/h, and it gets worse from there. Sandymount Green West tops at 66km/h, and Newgrove Avenue at 69km/h. Trucks and buses exceeded 60km/h and one truck is recorded as reaching 66km/h. It’s worth noting that these streets are congested and this lowers the 85% and the speeds listed here are only for between 7:00am to 7:00pm, even higher speeds can be expected outside of these times. 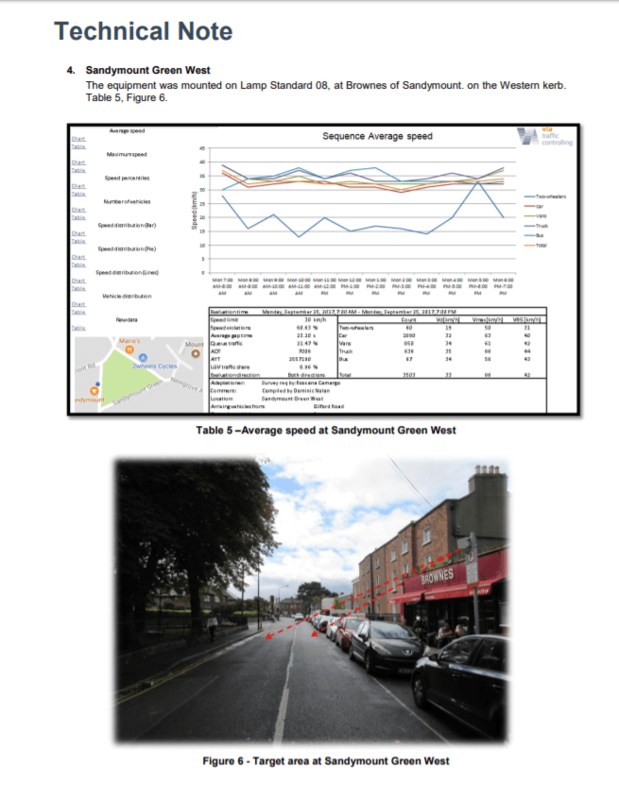 Without ever having visited the are (although I have), the data shows that Sandymount Green West has far more than local traffic on it, with over 7,000 vehicles per day and most people are exceeding the speed limit here — with 60% speed violations. The report outlines how one of the main issues Councillors highlighted was “No pedestrian lights or zebra crossing and No safety features on two of the three gates between the green and the very busy roads surrounding the green”. Why is all this needed? While it might be expecting too much for the council to deal with the elephant in the room (rat running), councillors and residents have known from the start that speed is an issue and so is the lack of crossings to the green. Engineers should not need studies and further work by consultations to tell them that at the very least pedestrian crossings or zebra crossings are needed. Engineers have spent time and money avoiding action, why didn’t they just use that same time to design and plan one of two of the crossings needed? Councillors and residents would have only been too happy to help find the best locations to start with. From reading the first 4 paragraphs I understand that the point of view is from the driver’s perception. Vulnerable road users, pedestrians and cyclists, are not taking in account concerning the measures. Claremont Rd is a rat run, taking traffic from Ballsbridge through the village to Strand Road. Ignored in this study.